Isabel is on a plane heading back to her island birthplace in Papua New Guinea. Izzy is looking forward to seeing her family again, but there's another tragic reason for the trip. Izzy's twin brother, Ray, died in a freak diving accident, and Izzy and her mum are taking his ashes home for traditional death ceremonies. After they arrive, Izzy realises things have changed siIsabel is on a plane heading back to her island birthplace in Papua New Guinea. Izzy is looking forward to seeing her family again, but there's another tragic reason for the trip. Izzy's twin brother, Ray, died in a freak diving accident, and Izzy and her mum are taking his ashes home for traditional death ceremonies. After they arrive, Izzy realises things have changed since their last visit. Logging threatens the community's way of life and sharks no longer answer the song of the shark callers.Izzy's cousin Noah explains that the clan needs someone to undertake a traditional diving ritual. The person must be a twin from the shark calling lineage. The dive will be perilous. And Izzy is the last twin. Will she have the courage to attempt the dive? And what deep, dark secrets will the ocean reveal if she does? The cover made this one hard for me to miss. I found it to be an enjoyable MG read as it has an interesting setting, an engaging plot and likable characters. What an exciting read! What an adventure. Nothing better that learning about a culture that I know little about. 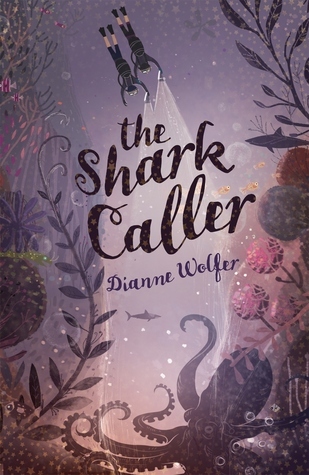 The Shark Caller is a story packed with sharks, danger and courage. Not being a diver, I found some of the story chilling.Great introduction to some of the world of Papua New Guinea. I even enjoyed using the TOK PISIN Glossary. The language add a richness to the story. It was really really interesting to read this book set in Papua New Guinea. Not based on historical or anthropological fact necessarily, and a bit of a fantasy, it does reflect the tension between tradition and modern rationalism. A very interesting story that grabbed me more as we headed towards the climax. Simple story effectively told through Izzy's eyes. A quest-of-sorts, a test-your-courage, a show-of-faith.But I am weary of kids losing their twin. Can this trend be over now? Ok. Thanks. bYee.